The Sony Cyber-Shot HX90V is the world's smallest camera in its class to boast a versatile 30x optical zoom Zeiss Vario-Sonnar T* lens (24-720mm), retractable OLED Tru-finder, and GPS functionality. Despite the HX90V's pocket-sized dimensions, it benefits from Sony's powerful 5-axis image stabilisation system, fast BIONZ X processor, built-in Wi-Fi/NFC, and a 3.0" LCD that tilts upward for easy framing and low-angle shots. Built-in GPS automatically tags your stills and videos with location information to enjoy on a map using the PlayMemories Home app. 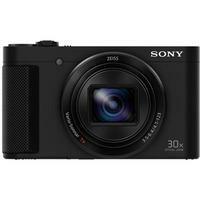 The travel-friendly Sony HX90V compact camera is big on picture quality and comes with a host of technologies and easy-to-use pro-style functions to deliver stunning pictures and Full HD movies with ease. Battery (NP-BX1), AC Adapter, Micro USB Cable, Wrist Strap, Instruction Manual and AC Power Cable.